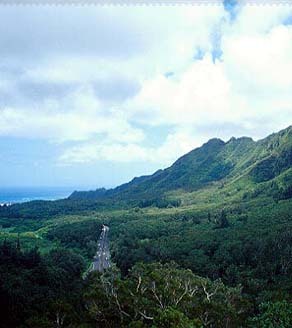 The Pali of Nuuanu as seen from the pass, with Lanihuli peak rising to the left. 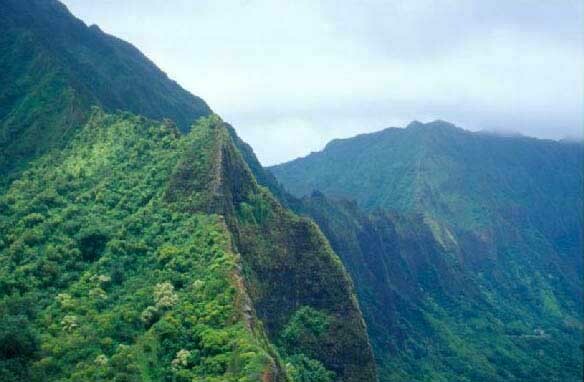 This sharp ridge divides the Honolulu side (left) from the Kaneohe side (right) of the Koolau mountains. 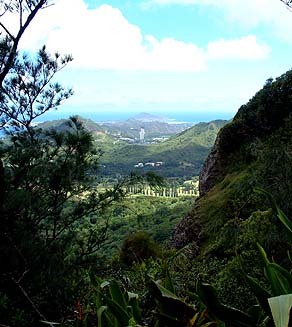 Near the top of the valley were two stones associated both with traveling the precarious Pali trail, and with the placement of piko (infant's navel cords). 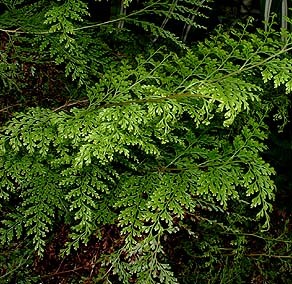 Their names are usually given as Hapuu and Kalaihauola. Mary Kawena Pukui states that the latter should be pronounced "Kalaiola," because of the word ola ("life") reflects that those who placed navel cords here were seeking life for their babies. Though there is no sign of them today, there are many bits of legend as well as first-hand accounts of these stones. Looking up towards the top of Nu‘uanu, from Sand Island. "Another thing that Umi-a-loa was famous for was his battle with the gods," Fornander records (1916, IV: 230). "The cause of this battle was in this way: His royal consort, Piikea, had supernatural grandmothers, who were Hapuu and Kalaihauola, and who desired to have a grandchild that they might take it to Oahu to bring up, because the mother of PiIkea, Laielohelohe-ikawai, belonged to Oahu...."
"As they returned to their house, he (Kamapua‘a) resumed the form of a man and went to Milolii," writes Kahiole (1861). "He picked up a large stone and tossed it by the side of the spring, Kanepuna. He continued from there until he arrived at Leleo. He turned his face toward Nuuanu and called to Hapuu and Kalaihauola, 'Grant life to Kekeleaiku, the beloved child of Olopana." "When you have passed mauka [upland] of this place," Po‘oloa (1919) writes, referring to Ka-hau-komo, "the noted spots are many and closer together. Hapuu and Kaleihauola are supernatural stones on the Waikiki side of the road. In front of us are Ka-ipu-o-Lono and Kapili, which are two hills." "I saw them on the edge of the cliff by the old government road....Right above a grove of hau trees are two stones. One is a long stone, with back nicely smoothed. It is about three feet long. The other is more rounded with corners. The long stone is towards the lowland and the other is towards the upland. 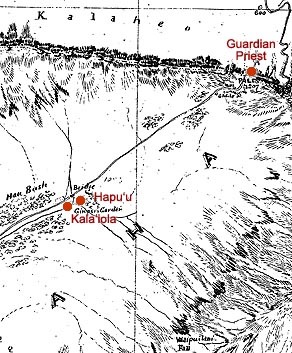 The one on the lower side is Hauola and the one farther up is Hapuu...."
The top of Nu‘uanu Valley, showing the approximate locations of the three stones discussed on this page, based on various accounts. As of 1954, the two piko stones could not be located and were believed destroyed. 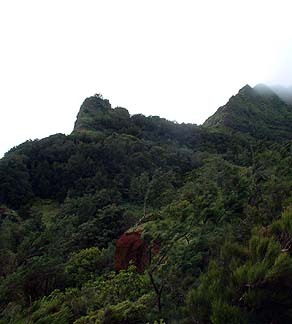 The Guardian Priest stone is said to be on the Kane‘ohe side of the Pali. The precipitous drop-off at the Pali, to the forest below. 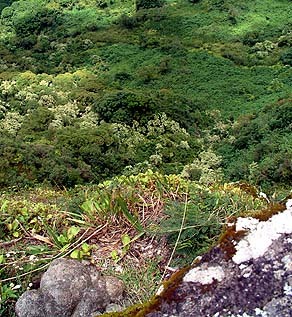 "Within a few yards of the upper edge of the pass, under the shade of surrounding bushes and trees, rude and shapeless stone idols are fixed," wrote British missionary William Ellis (1831: 15), "one on each side of the path, which the natives call 'akua no ka Pari', the gods of the precipice; they are usually covered with pieces of white tapa, native cloth; and every native who passes by to the precipice, if he intends to descend, lays a green bough before these idols, encircles them with a garland of flowers, or wraps a piece of tapa around them, to render them propitious to his descent; all who ascend from the opposite side make a similar acknowledgment for the supposed protection of the deities, whom they imagine to preside over the fearful pass." "Again the old people said that their ancestors had been accustomed to bring the navel cords of their children and bury them under these stones to insure protection of the little ones from evil, and that these were the stone women of Nuuanu." Looking down the valley from the notches. Somewhere not too far down from here stood the piko stones. "O Hapuu, accept the umbilical cord of my child. Grant him health and every good." C.J. Haole (1895) adds, "The god, Hapuu, is a pohaku piko on the east side of the Nuuanu road near the Pali. Its companion, Kalaehauola, is also a rock on the west side of the same road. The above prayer is offered when a piko is placed in the rock that it may not be eaten by rats." Raphael Pumpelly (1870: 69) tells of digging into one of these stones, believing he was retrieving a rare, waxlike mineral. "Much to my astonishment, the prize produced from the hole was a half-decayed rag. A closer examination of the supposed mineral...showed that it belonged decidedly to the animal kingdom. Mr. Carter asked an explanation from some passing natives. They explained that the substance found was the navel cord of an infant, it being an ancient custom, at the birth of a child, for the parents to hide this part of the infant to whom alone the place of concealment is afterward shown. " There is also a Guardian Stone (pohaku kiai) of the Nuuanu Pali pass, a stone that used to reside on the Kaneohe side of the Pali gap. It is said he was a man, or a lizard god, who was sent there to watch out for the hula women of Honolulu side, who used to come over the Koolau mountains and steal the men of the hula women on the Kaneohe side. "He was a man—a priest of the lizard god, on special duty at the pass. His was the task of exacting fees from the daring souls who scaled the cliffs or ventured the valley of haunted house. "For a long time he served and neither the gods nor the priests complained of the number of dogs or pigs or bowls of poi. "Only once, in years and years, did a traveler pass without paying his fee. That was the day when a woman danced on the top of the peak. "The dancing woman came from Heeia, a town on the plain. Her body was fair, and she knew she could dance. Her mind was keen." View through the Pali gap. The ridge above the pass. "She planned to go to Waikiki. For the king she cooked a dog and some poi, and she made enough for the valley priests. But for the greedy priests of the lizard god, she cooked nothing at all. She resolved to dance. "Up the pali cliff she came, marching on ahead of her men. She scaled the ridge above the pass; she climbed to the very topmost peak. And there, on a spot where her form could be seen in the pool that glistened at the guardian's feet, she danced. "She danced like mad on the top of the peak—and her reflection danced like mad in the pool." 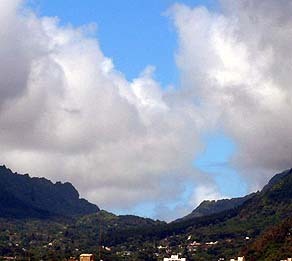 The Nuuanu Pali from Kaneohe. "Soon from the mind of the guardian priest, every thought, but of love, had fled. He gazed into the pool. "At last, the men had reached the pass. They went stealthily on to the forest of the hau's. The dancing ceased. "With a start, the dreamer awoke from his trance. He recalled the trail. "But already the gods had turned him to stone. And here he stands, to this very day, a victim of love, and the wrath of a god, while down below, covered with leaves, is the fateful pool."